Carom , Intimidation Bolt , Guided Strike , Lightning Blow , Pressure Point , Rile , Stun , are all fine. Burning Prophet or Tenth District Legionnaire makes all your cantrips into Opt s.
I like the feedback, but I can't say I agree too much. I'll go through everything you mentioned, and explain.When it comes to anything with prowess, the copies of the spells from Zada, Hedron Grinder aren't cast, but simply appear on the stack. Thus, each copy does NOT trigger prowess, rendering the ability nearly useless. As for Ogre Battledriver and other haste effects, I simply don't get enough creatures in a single turn to merit that. The deck doesn't explode creatures onto the board, it explodes the creatures' power and toughness that are already there. As for enchantments and artifacts in general, such as Dictate of the Twin Gods, Flameshadow Conjuring, and Panharmonicon, the deck benefits more from simply having more bodies on the field than it does from these effects. Even effects like Genesis Chamber, Warstorm Surge, and Flameshadow Conjuring which combo with creatures aren't as effective as simply getting more creatures. In fact, I'll go through these individually. Genesis Chamber doesn't help very much, because I'm trying to get as many tokens as I can. Sounds like a contradiction, yes, but Genesis Chamber only triggers off of nontoken creatures, meaning it gets significantly less value than probably any card I could cut for it. Warstorm Surge is simply way too much mana for an underwhelming effect. Because the deck has a lot of 1/1's, Warstorm Surge is almost exactly equal to it's 2 mana counterpart, Impact Tremors, which makes it not even remotely worth the cost. Flameshadow Conjuring doesn't work because, again, it only works with nontoken creatures. However, it also uses up my precious red mana, and the token disappears. It's just not on the battlefield long enough to do anything useful with it. Kiki-Jiki, Mirror Breaker also already does this, and better than it does. Also, the deck just doesn't have enough ETB to try and build more around it, such as using Panharmonicon, however Purphoros, God of the Forge because he's also a creature, and Impact Tremors because it's very cheap mana, and very efficient. Notice it deals 1 damage to each player, while Warstorm Surge only deals damage to target creature or player. Only one target. Also, any draw that also discards is more detrimental than helpful. Yes, Chandra, Flamecaller can refill my hand, but if I'm in the situation requiring my hand to be refilled I should have won the previous turn. The same goes for any wheel type effect, as well as exile off the top of the deck effect. The reason Rile works is because I control the stack. I let it deal damage to a creature that survives, then draw a card, one by one until I get a card that buffs toughness, then cast it at instant speed, assuming I can, targeting Zada, Hedron Grinder of course, and then all THOSE go on the stack and trigger before the rest of the Rile's, thus all my previously 1/1 tokens survive and I fill my hand and buff my board to win. The same goes for absolutely any spell that single targets Zada, Hedron Grinder that says "Draw a card" on it. And yes, even the ones meant to target opponents boards, because drawing half my deck for 1-2 mana lets me get the buff spells I need to literally win. Yes, that means Stun is good and staying. Panic and Balduvian Rage are also great because they can set me up for the next turn, meaning I don't have to try and win immediately. This leads me to Kari Zev's Expertise, because of how the stack resolves and how I can manipulate it, I can cast it on Zada, Hedron Grinder and then it will be copied for all of my other creatures. 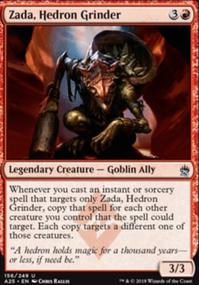 Not only is this a source of haste, but how it will play out is, let the first Kari Zev's Expertise resolve on a creature of mine, then play the free card, targeting Zada, Hedron Grinder, and let that and all of it's copies resolve. I will have tried to cast a card that draws, as long as I draw immediately. With all the new cards in my hand, the second Kari Zev's Expertise resolves, and then I cast another spell for free, targeting Zada, Hedron Grinder, and then that spell resolves, and hopefully also drew cards. At this point, I should have enough combat tricks to win the game, and still have hopefully another 3 or 4 Kari Zev's Expertise's left on the stack. I'll cast free combat tricks from each one of those, and should win that turn. Kari Zev's Expertise is one of the most consistent ways to pop off in the deck. As for the creature curve, I'd like you to take a look again at how strong each creature in the deck is. I'll go further into detail in a second. First, the artifacts I have cap out at 2 mana, and 4 out of 6 either give mana, reduce mana costs, or draw cards, all effectively helping me reach the creatures and allowing me to play them. Also notice the creatures that literally give me mana for almost free. Treasonous Ogre for example. Pay 3 life for a mana? That's easy, the max life I pay is 18. That's less than half my life total. Normally I'll be paying a cap of 9-12. Also, consider that cards like Emrakul's Hatcher is more than 5 mana for a 3/3. It's 5 mana for 4 bodies, which can all be buffed, and give card draw. That goes for any creature that creates a token in the whole deck. Look at it as mana cost per body, rather than mana cost vs power/toughness value. I also don't want to run tribal, because it would require too many cards to shift over to more tribal base, and slow down the deck in its entirety. Now for Neheb, the Eternal, and other more expensive creatures, I'll go through one by one. Charmbreaker Devils is interesting, because 6 mana is literally the very top of the curve, and as I've already stated, his second ability won't trigger per copy, only on the initial spell. The real deal with him, is that his second ability gives him +4/+0 instead of +1/+1, which is a much better deal, and stacks up MUCH faster. As well as with his first ability, it allows me to continue to have steam when I really shouldn't. Emrakul's Hatcher, 5 mana, 4 bodies. Not much else to be said, just great value for the mana cost, because have 4 extra targets for my copied spells is great. Pia and Kiran Nalaar are in the same category as Emrakul's Hatcher. Goblin Dark-Dwellers is also a card that gives me fuel when I should be out. It also works very well with Kiki-Jiki, Mirror Breaker to continue casting spells of my choice out of my graveyard. Kiki-Jiki, Mirror Breaker, I don't really have to explain why this is here, do I? Oh, and yes, it combos with combat celebrant for potentially infinite combat steps. Mirrorwing Dragon, this should also be obvious why it's in the deck. 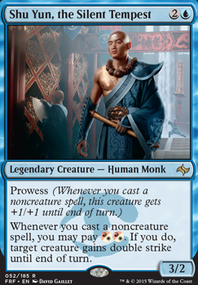 Neheb, the Eternal, is great because it helps set up for following turns. If I can get Neheb out early, and deal some damage, I can get enough mana to cast more creatures for my following turn. If I don't get Neheb out fast, then too bad for me, I'm sure I had something else to play. Siege-Gang Commander, 5 mana, 4 bodies, enough said. Goblin Rally 5 mana, 4 bodies, enough said. The thing with this deck, is it can work with a low amount of tokens. Yeah, higher amounts of tokens are preferred, but 4-5 is the minimum. Which is obtainable through a single card. I don't need 20 goblin tokens, I only need 6 and expedite. I don't need them to attack the turn they hit the board, so I don't require haste. Hopefully this explains why all the cards that are in, are in, and I think I responded to everything in your comment. You also have cards like it but others that give good buffs are Reckless Charge, Borrowed Hostility, Rouse the Mob, although I would stick to mostly the one mana ones cause they are just easier to cast and you can cast more. I also noticed you had some goblin tribal which is good but you could add Goblin Rabblemaster, Goblin King, Coat of Arms, Ib Halfheart, Goblin Tactician, and Goblin Assault, those combo well together to make all of your goblins more powerful. The last main effect I noticed was some etb effects here are some I noticed weren't in there Genesis Chamber, Panharmonicon, Warstorm Surge, Flameshadow Conjuring, I would recomend either going for this effect all out and adding as many ways to etb hurt people as possible or not runing any except maybe Purphoros, God of the Forge cause it can be a place to dump mana if you don't have anything to cast. 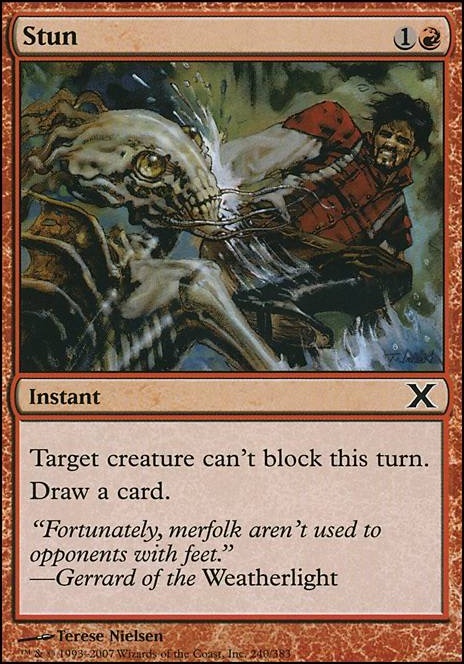 I noticed you had some spells that target a creature and draw a card which I understand cause it is good but some aren't meant to target your own creatures and I think you would benefit from some better draw like Chandra, Flamecaller, Avaricious Dragon, Outpost Siege, Magus of the Wheel, Dragon Mage, Reforge the Soul, Hazoret's Monument, Ghirapur Orrery, these are better than some of the targeting draw spells you have in cause they are more consistent. Alright so now that you can see some good cards time for what I would cut Goblin Rally for Goblin Rabblemaster even though rally gets more goblins at once rabblemaster is cheaper and buffs himself. 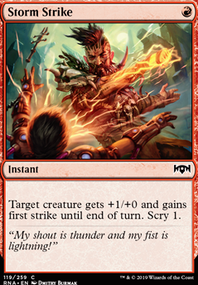 Also Kari Zev's Expertise is the only take control spell and while you can cast something for free the only reason I could see to run it is to target your own board and cast lots of cheap instants for free but how often would that work? Also Stun, Panic, these can draw you lots of cards but these aren't meant to target your own things and there are better ways to make it so your opponents can't block and so the only reason I see these for is to draw cards and there are more consistent ways to draw cards. Rile, same thing even though they get trample the deal a damage to all of your creatures which would kill a good amount of them without buffs which you could also do but wouldn't it be nice to draw without having to worry about board wiping yourself. Alright now talking strictly creatures...wtf are you doing... when you look at the curve to the left it's "Man my curve is so good I'm always going to have a spell to cast each turn." then you look at your creature curve. 1 1drop, 4 2drops, 8 3drops, 6 4 drops, 7 5drops, 1 6drop. With that curve of creatures you probably aren't going to cast a creature spell (I included the sorceries that give creatures in this.) until turn three which means you cast your commander turn 4 and can start attacking turn 5 with 2 creatures (this doesn't account for ramp, or multi-creature spells) so you then have to take another turn or two to keep casting creatures. That is to slow for this deck you need to start picking up damage alot earlier if you want to win. There are also creatures in here (While amazing.) 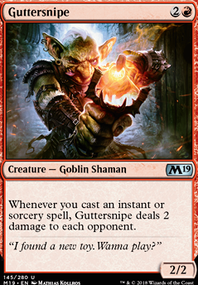 don't work as well in your deck as going more goblin tribal like Neheb, the Eternal He is really good but when are you going to cast things after combat. you should have enough haste to never need his ability for mana. That is the first one I would cut to make room for a cheaper spell other than that you need to lower your curve (or add more ramp and haste) cause even though you would get more value off your spells you would be to slow in attacking so I would stick to four or five that give you the most creatures. I think it would be great if you made this a mostly goblin tribal deck cause #1 they flood the board with 1/1's for you to target. #2 you can get some great synergy cards and make it so your goblin's are helping each other. #3 Who doesn't love tribal decks especially ones that are outside the box like this one would be. #4 Goblin Bombardment who is going to boardwipe ten to twenty goblins when in response to the wipe you sac all of them and hurt them alot. Well those are my thoughts on it as you probably see I didn't add every effect or explain the many uses of some cards cause I think you will see their value I merely am pointing out the main changes I would make to the deck, let me know what you think of them and I hope I didn't offend you cause that is not my intention and I would love to comment again if you make changes. Well, so is Stun in the right deck, and both are very situational but from a general power level Cruise is much higher than both. Yesterday on House of mirrors. Oh, thanks for getting back so quickly! I'm not sure how I missed Renegade Tactics actually, especially considering I included Stun and Panic already, but it's neat and definitely gets some funny points for getting tonnes of value from making my own creatures unable to block during my own turn. I was concerned that a lot of the creature-spawning effects depend on already having creatures out, so that's definitely something I'm going to be tinkering with when I actually build the deck and get to try it out. Empty the Warrens could actually be great considering there are a number of really cheap draw spells in here.